Full, big resin glands loaded with THC are what we want more of on our marijuana flowers. The important news today is when you feed the earth element silicon to your marijuana crops as potassium silicate, you get verifiable, significant increases in THC, crop health, growth rates, and productivity. Silicon is the second most abundant element in the earth’s crust (oxygen is the most abundant). Silicon plays a major role in plant metabolism, nutrients uptake, structural strength, resistance to fungal diseases, pests, drought, heat, and cold. By end of grow phase, marijuana plants grown in soil have exhausted their supply of silicon. And in some cases, soil silicon is not easily absorbed by marijuana plants. Your marijuana plants may grow adequately without silicon, which is the main reason silicon hasn’t been deemed an essential element that must be included in hydroponics base nutrients formulas. But evidence shows that without feeding added silicon to your crops, you’re missing out on healthier, stonier, more productive plants. When your medical marijuana plants intake silicon as potassium silicate, they build it into their cell walls. Marijuana plant tissue samples show that silicon-enhanced cell walls are sturdier and more resilient than cell walls in silicon-deprived crops. Silicon-enriched cell walls provide structural support for your plants so they have sturdier stalks and stems that support larger buds. You know how much damage that sucking/biting insects such as mites, thrips, aphids, and other insect attackers can do to your marijuana plants. Silicon-enriched cell walls make it harder for predatory insects to feed off your marijuana plants. Silicon-enriched cell walls also armor your plants internally and externally against damage from heat, intense light, cold, drought and humidity. Silicon (as potassium silicate) is absorbed via roots and transferred from cell to cell inside the plant, where it becomes a powerful potentiator of your marijuana’s metabolic processes, acting as a balancer and facilitator that increases uptake of other nutrients, fuels photosynthesis, and filters pollutants such as salts and heavy metals. Potassium silicate also reduces oxidative stress (it’s an antioxidant). When your marijuana plants are silicon-enriched, they’re better able to resist gray mold, powdery mildew, and other pathogens that cost growers millions in losses every year. Marijuana plants fed silicon as potassium silicate have healthier, denser roots that uptake nutrients, oxygen and moisture faster, and they’re more resistant to root diseases. For you as a marijuana grower, the important news is that potassium silicate increases the formation, sturdiness, size and resin content of THC glands. Your resin glands are the primary reservoirs of THC in your plants, but they’re extremely vulnerable to rupture and other deterioration caused by heat, drought, predators, intense light, humidity, molds, mildews, nutrients problems, and rough handling. Added silicon boosts the size, hardiness and resilience of your buds and resin glands, giving you heavier, more potent buds that are better able to resist forces that reduce crop quality and weight after harvest. When you enrich your medical marijuana plants with potassium silicate, you extend the shelf life of their resin glands and THC. This means your crops retain more of their potency, taste and aroma for longer periods of time. Your crops are more valuable to you and others who depend on your buds. Now that you’ve seen how adding silicon to your marijuana feed program is a proven way to get healthier plants and more-valuable buds, you’re surely wondering what’s the best way to get silicon into your plants. 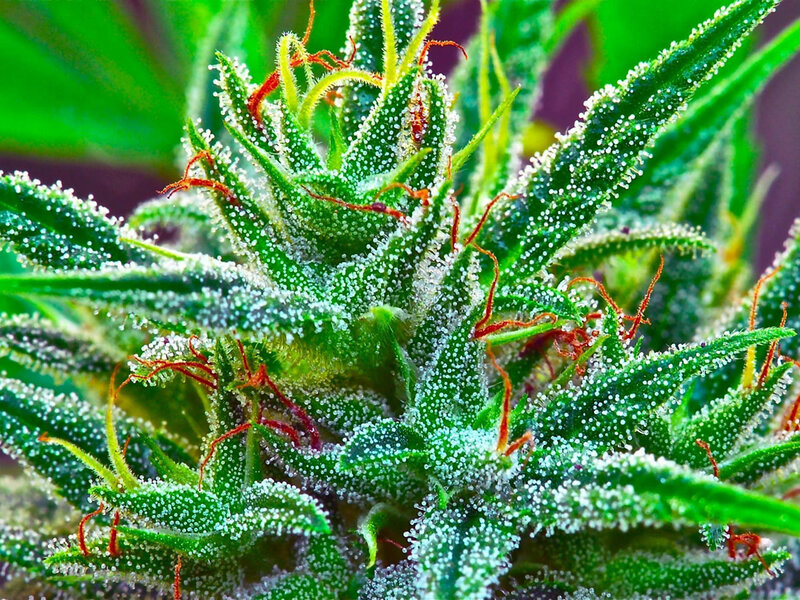 Marijuana plant scientists determined that potassium silicate is the preferred form of silicon for marijuana plants. Using potassium silicate has the added benefit of providing potassium to your crops– as you’re aware, potassium is a marijuana bud booster. Without getting into too much chemistry, let’s understand that other forms of agricultural silicon, such as sodium silicate and lithium silicate, cause problems for your plants. Lithium silicate causes toxicity. Sodium silicate has a big problem: sodium. In fact, excess sodium is already a big problem for marijuana plants growing in soil or soilless hydroponics systems. Marijuana scientists describe this as “plant salt stress,” and they point out that it slows marijuana growth, reduces yield, and can even kill your plants. Salt stress is a problem indoors and outdoors. Indeed, one of the main harms of industrial agriculture fertilizers, and the use of desalinated water, is that it spreads excess salts that create soil toxicity. Remember that silicon must be provided in amounts appropriate for your plants, and in the right form. As with other nutrient elements you feed your plants, an excess or deficiency of silicon can cause crop problems. So it’s not enough to just throw silicates into your feed program… you must send in the right amount of potassium silicate, and it’s best if the potassium silicate is provided to you in a properly-manufactured liquid solution. As a hydroponics marijuana grower, you only have a handful of product choices when trying to add silicon to your medical marijuana plants. One product is Botanicare’s Silica Blast, which contains sodium silicate, potash and potassium silicate. Note also that Botanicare is now owned by Scotts Miracle-Gro, so it’s best to avoid all Botanicare products. You already know why any product with sodium silicate is not good for your medical marijuana plants– too much salt. Dyna Gro makes a “Pro-TeKt” product that contains potassium silicate; Dutch Master and Grotek also make silicate products. I called Botanicare, Dyna Gro, Dutch Master and Grotek to ask how their products work for marijuana, but they refused to talk about marijuana growing. When I reached a technical advisor at Advanced Nutrients, I learned more about their potassium silicate product called Rhino Skin. I had already learned potassium silicate is best delivered as part of a liquid solution rather than a dry powder or granule. The tech advisor noted that hydroponics marijuana growers gotta be careful about using most potassium silicate products, because potassium silicate can play havoc with pH and nutrients absorption, and because too much or too little potassium silicate can be worse than adding none at all. Apparently, Rhino Skin is an upgraded version of a previous hydroponics product, Barricade, that works with the bloom phase nutrients system based on base nutrients that guarantee optimized pH and maximum nutrients absorption for your plants. I talked to marijuana grow guru GrowDaddy (50+ years of marijuana growing experience) about potassium silicate. He had over the years tried all the potassium silicate formulas on the market, and decided that his best bet was to use Rhino Skin as a root feed and as a foliar spray. GrowDaddy uses potassium silicate for soil and soilless grows beginning in mid-veg phase and continuing through bloom phase, especially for plants like Kush that grow best with a heavy dose of hydroponics nutrients, and any plants known to produce higher than average THC gland percentages. As a root feed, I use potassium silicate per the manufacturer’s directions. As a foliar spray I use zero ppm reverse osmosis water, half-strength Wet Betty organic surfactant, and one eighth to one quarter strength Rhino Skin. I adjust the solution to 5.7 pH. When I’m finished mixing, the foliar spray averages between 110-170 ppm. I use this spray, sometimes in combination with other supplements during the latter two thirds of my grow phase and the first two weeks of my bloom phase. Foliar spraying potassium silicate is a preventive against powdery mildew, mites, thrips, aphids, heat, gray mold and other stress that attacks your plants from the outside. It also transfers potassium silicate into your marijuana plants at a crucial time…when they’re forming buds and resin glands. This strengthens your glands, increases the density and development potential of your bud structure, and gives you more THC. Now you’ve seen how potassium silicate makes your cannabis plants safer, stronger, healthier, faster-growing, and heavier-yielding, I’m sure you’ll get hold of hydroponics potassium silicate and enjoy the increased THC benefits today.